Designed for puppies from weaning until 12 months of age. It is also excellent for pregnant or nursing dogs. A growing puppy needs twice the nutrients that an adult dog needs. 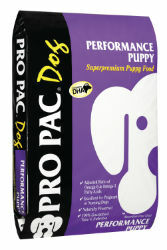 PRO PAC ® Performance Puppy is made from quality ingredients such as chicken meal and chicken fat. It assures that your active puppy will receive proper nutrition for growth and development: Extra calories for energy and growth, More protein, to help form muscles, organs and strong bones, and DHA for brain and eye development. Naturally preserved and contains no by-products. A standard 8-ounce measuring cup holds approximately 4 ounces of PRO PAC ® Performance Puppy. Chicken Meal, Ground Yellow Corn, Chicken Fat (preserved with mixed Tocopherols, a source of Vitamin E), Dried Beet Pulp, Dried Egg Product, Natural Flavoring, Flaxseed, Yeast Culture, Salt, Potassium Chloride, Choline Chloride, DL-Methionine Hydroxy Analogue, L-Lysine, Vitamin E Supplement, D-Activated Animal Sterol (source of Vitamin D3), Vitamin A Acetate, Niacin, D-Calcium Pantothenate, Biotin, Vitamin B12 Supplement, Riboflavin Supplement, Thiamine Mononitrate, Ascorbic Acid, Pyridoxine Hydrochloride (Vitamin B6), Folic Acid, Manganous Oxide, Ferrous Sulfate, Copper Sulfate, Zinc Oxide, Calcium Iodate, Zinc Proteinate, Manganese Proteinate, Iron Proteinate, Magnesium Proteinate, Copper Proteinate.